Could it be that when two people work closely together, they start to look alike? You know, like old married couples and pets and their owners? 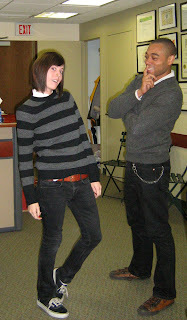 Hmm, let's check out our own Martin & Mazza, a young, smart team who favor a style I like to call "preppy punk." They've spent many months this past year working together in a very small office. As you can see, he texted for naught. What's at play here? Are their style moons perfectly aligned or did the intimate office environment influence vital wardrobe decisions? Let's examine the facts: both wear great belts; both favor the dark skinny jean; both keep the tailoring neat; both adopt a stand-out signature [Martin with hats and Mazza with glasses (above) and red nails (left)]. The plot thickens. We'll continue tracking this modern nature v. nurture mystery as more clues emerge. Where Martin shops in the district: H&M, Macy's, Gap. Where Mazza shops: Uniqlo and Urban Outfitters. I'll convert her to a district store yet. 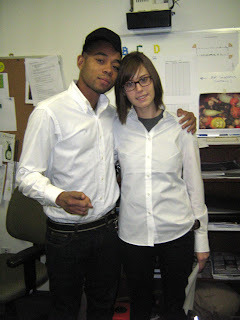 Martin says: Get undershirts at the Gap and make them fitted and more comfortable by drying them on high heat. Ahh, nothing like the shirt well done from the dryer. Mazza says: She'll never buy anything from Sarah Jessica Parker. Mazza's tough, but wait till she hears Bitten has pea coats for $19.98.